Team Hawaii continues to roll at the Oceania Swimming Championships in Papua New Guinea. For the second day everyone qualified for finals held just a couple hours ago and finished the night with 1 Gold by Grace Monahan 4:55.57 in the 400 IM/ 3 Silver by Grace 50 Bk 30.37, Mike 51.31 in the 100 Fr and Maile in the 100 Breast 1:11.45/ and 2 Bronze, one each in the boys and girls 4 x 200 Free Relays. Sydnee also won 7th in 50 Bk 32.30, Michael 5th 50 Back 27.84, Maile 5th 400 IM in 5:12.28, Jaek Horner 6th 4:45.86 400 IM, Sydnee 5th 58.59 and Jasmine O'Brien 8th 100 Free, Tyler 6th in the 100 Free and Jaek 6th in the 100 Breast 1:05.11. Joe Ahia and Tyler went first and second in the B Final 100 Breast with 1:07.70 and 1:09.15, both PB's. 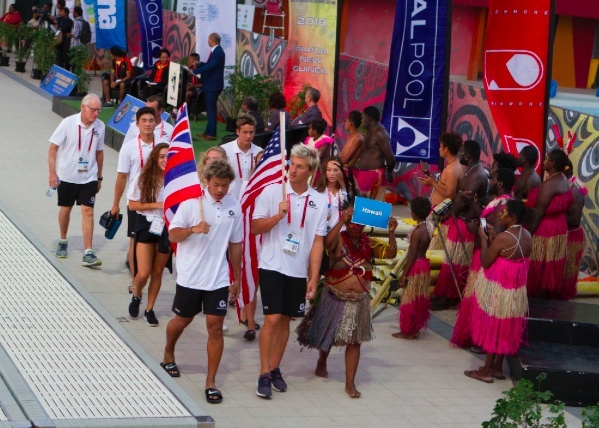 In relays Hawaii was a close 4th to Fiji in the 200 Mixed MR by .11, however both the boys and girls 4 x 200 Free Relays picked up Bronze medals. 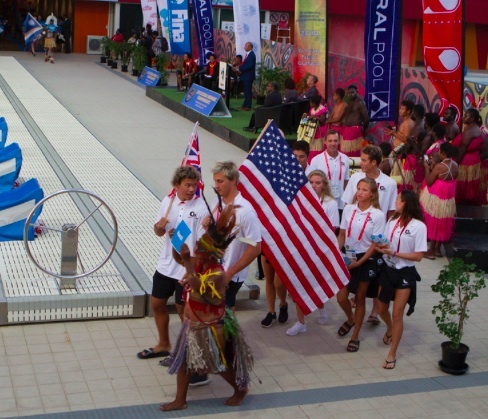 Top teams are Australia and New Zealand, however with many smaller island swimmers are going to Australia or USA for schooling, while competing for the home nations. 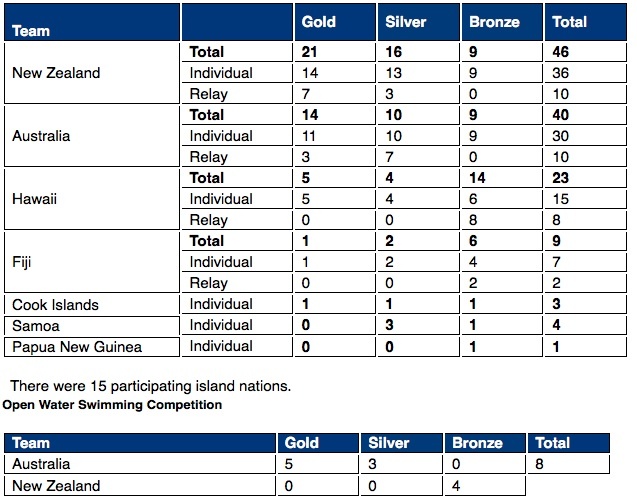 Fiji, Cook Islands and Samoa have such individuals who have swum quite well in these Championhips. New Zealand has been winning most events followed closely by Australia and New Zealand swimmers. Team Hawaii has two more days left of pool competition and on Saturday the 10km swim with five swimmers entered. The team has done the best in accumulating medals and we hope to add more in the next couple of days. There are also medals to the top "other" island winners, excluding Australia and New Zealand, to encourage swimmers in these islands also. Hawaii swimmers have also won several of these.